Colorado Clivia Company is a collector of all six Clivia varieties. This section of our website presents photographs of our collection--mostly in bloom. Since our Clivia collection has several new additions each year, the collection of photographs also changes overtime. And as younger plants mature, their blossom's appearance may improve and change. 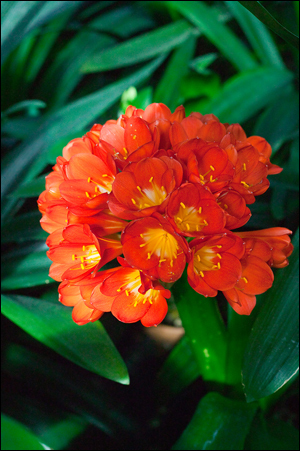 New photos are typically added after the spring Clivia miniata blooming season and the fall Clivia gardenii blooming season. All photos in the web pages listed below are copyrighted. All rights are reserved. Viewers of this website may download and reuse the photos for private, non-commercial uses only. All current photo meta-data shall remain unchanged. If the photos are published in print, electronically, or by any other means, Colorado Clivia photo credits are required. To request additional information about a specific plant in the photos please via email and reference the name and plant number of interest.